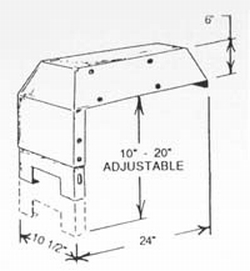 Adaptable to most aluminum or fiberglass boats. Manufactured from .090"- thick material. 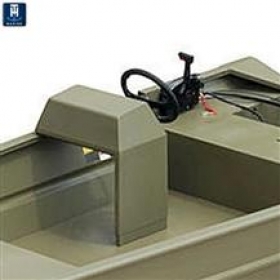 Width: Overall 24", Top of Console 20"
Depth: Overall 10-1/2", Top of Console 5-1/2"
Height: Overall - Adjustable from 16" to 26"
Space under console: Adjustable from 10" to 20"
Steering and gauge mounting panel surface is 20" x 6"
Top surface of console is 20" x 5-1/2"
This product is NOT painted. console is well made and the adjustable leg is great. I am very pleased with it. The console is well made and is very attractive. my neighbor is in trouble with his wife because after seeing mine he wants one too! "Ordered on a Friday and received the package on Sat. Item exactly as described." "I received my parts very fast and were in perfect condition and would order from them again"
"Easy ordering process and super quick shipping. Outstanding online purchasing experience. Will..."